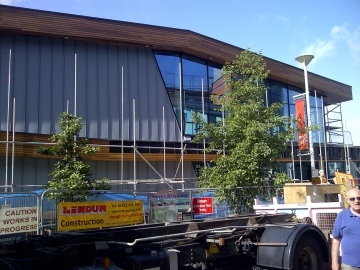 Increasing numbers of home owners, commercial building owners and architects are discovering the desirability of using Timber Cladding as an alternative facing material on both new builds and refurbishment projects. Bennetts Timber is able to supply you with a wide range of cladding and related products â€“ including Western Red Cedar, Siberian Larch and Thermowoodâ€“ other non-stock species such as oak can be sourced too. Bennetts Timber also offers pre-stained or painted cladding, corner mouldings, customised profiles and fixings. It's all about getting value for money and Timber Cladding is an excellent cost effective alternative to the traditional facing materials such as brick or render. With cladding it is possible for you to make even the most unattractive building look appealing, regardless of whether you use a horizontal or vertical design it will look sensational. No other building material can be compared to the durability, flexibility and aesthetic appeal of timber â€“ from the pale honey yellow of Siberian Larch to the richer dark of Western Red Cedar, which eventually turns a fine silvery grey if untreated. Whilst it is down to individual preference whether the timber cladding is to be installed untreated, we can apply a number high performance and high durability water borne stains within our factory facility prior to delivery. The stains are available in a number of colours and for further peace of mind a UV protector can be applied too which will help protect the timber from the vagaries of the British weather. With both residential and commercial projects, UK Building Regulations stipulate that fire retardant protection must be applied to the cladding in certain situations, usually where there is less than 1 metre between buildings or whenever used on multi-storey buildings. Again, we are able to pre-treat with an appropriate fire protection product before delivering to site. All of our timber is sourced from well managed forests, so that it is a sound, certified environmental product that you can be sure is from a sustainable resource.